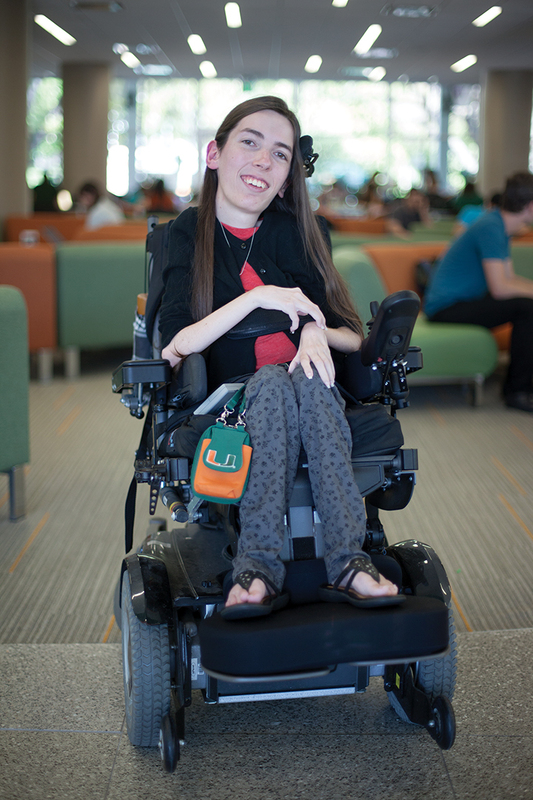 Junior Audrey Winkelsas was not going to let spinal muscular atrophy, a form of muscular dystrophy, stop her from attending the University of Miami. Before college, she depended on friends and family to help care for her. Originally from Apopka, Fla., a suburb outside of Orlando, she requested 24-hour, attendant care through Medicaid for her time at UM. Her parents and friends could not travel 250 miles to help her in Miami. All was fine until Winkelsas celebrated her 21st birthday in October. According to Florida’s Medicaid provider handbook, necessary services like around-the-clock care are suspended after a person turns 21. Winkelsas discovered the news when she returned to campus after studying abroad in London last fall. Since she was out of the country, she could not receive healthcare attendant services. Instead, her mom, Keely Winkelsas, traveled with her, understanding it was a once-in-a-lifetime opportunity. Since classes for spring semester began, Winkelsas’s mother has had to stay in Miami to ensure that her daughter can go to class and finish her studies. During her senior year of high school, Winkelsas requested a healthcare attendant through Medicaid. She was initially granted only two, three-hour visits per day. However, through a round of appeals at Medicaid she was provided 24-hour care. And for the last two and a half years, four different attendants, who worked 12-hour shifts at a time on different days of the week, looked after Winkelsas as she completed her studies. Two years later, Winkelsas is again appealing, but the process has been more difficult than the last time. After going through countless rounds of appeals, Winkelsas was granted only three, one-hour visits, none of which could be consecutive. While her mom stays with her, Winkelsas’s father Layne Winkelsas runs the family printing business back in Apopka on his own. The business has been understaffed because of the recession. Winkelsas was aware of the turning-21 clause in Florida’s Medicaid provider handbook. But she has other friends who were a few years older and had successfully appealed. Winkelsas was confidant that anyone who met with her would understand her need for 24-hour care. But halfway through the semester, she has had no luck in reversing Medicaid’s ruling. Winkelsas says her mother makes phones calls every day, trying to find her daughter 24-hour care. They have taken tips from friends, and have even called their local representative in Apopka, Bryan Nelson. Nelson forwarded the message to Senator Marco Rubio and Gov. Rick Scott’s offices. UM President Donna E. Shalala is personally involved as well, according to a university spokesperson. Though she thinks of herself as shy, Winkelsas decided to start a petition on Change.org last week to bring attention to her problem. In just 24 hours, the petition was filled with more than 5,000 signatures. At the moment, the petition has 6,833 signatures, and only 667 more are needed. “We thought if more voices were supporting us it might get someone’s attention,” she said. Winkelsas is studying biochemistry and intends to find a cure for spinal muscular atrophy, the condition she was diagnosed with when she was seven months old. To sign the petition, visit tinyurl.com/audreywinkelsas.